During the cold winter months maintaining a proper insulation setup is crucial to enjoying a good night of rest. It can also make or break your outdoor experience. Personally one of the biggest contributors to my system is my down underquilt. Unfortunately, one issue that occurs from time to time is that the UQ slips out of position along the edges during the night. This can cause problems by removing the protection around your knees and shoulders as they press against the hammock fabric. If you find yourself waking up at night to readjust the UQ this mod might be for you. The solution I chose was Dutchware Quilt Hooks. 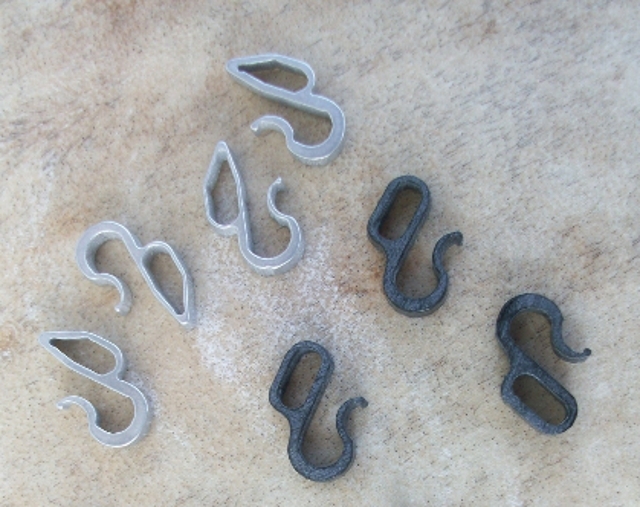 These hooks are available in aluminum or plastic. They are also available as sew-on or clip-on hooks. I went with the sew-on style but will be using the clip-on in a future update. The first thing I did was lay in the hammock with the UQ in place until I had it positioned where it covered me like I want. I have to thank my son for being my helpful assistant. Next I measured from a fixed position on either end to put the hooks close to the UQ ends while still allowing some movement for fine tuning. I didn’t want to put the hooks at the exact ends and then be locked in to that specific position. I found that 10″ was optimal on both ends. Once I had the position marked I took to needle and thread. 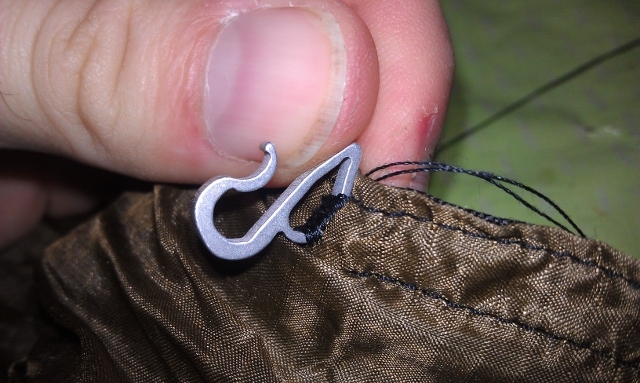 Make sure you position the hook with the curved end facing you so the opening will be facing the UQ suspension. It took about one hour to sew all four hooks in place. 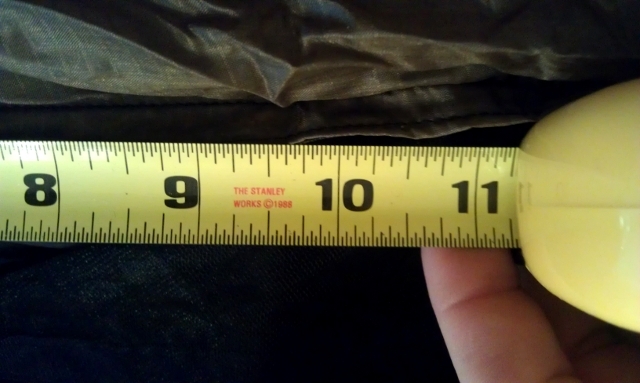 It would’ve taken about 45 minutes had I paid attention to this last step and not sewn one on backwards. 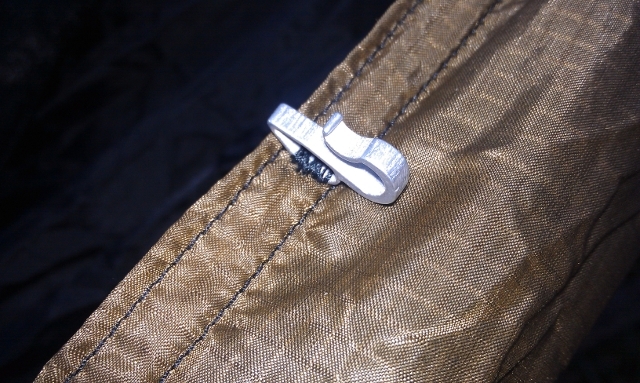 Once you have all of the hooks in place attach your UQ as you normally would. 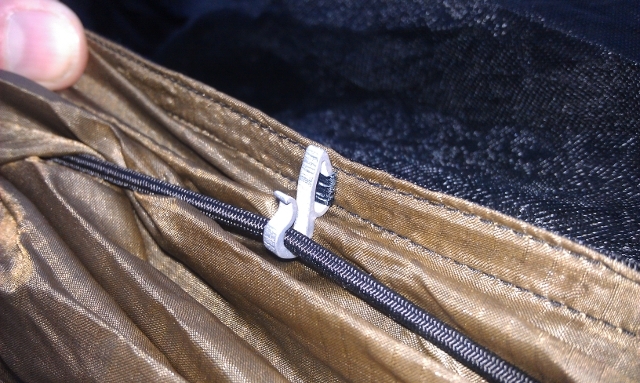 Once it’s attached take the UQ suspension and clip each side into its respective hook. This should ensure that no matter what you do during the night your UQ will always be held snug against your hammock keeping you toasty warm.